- "Duma Key" by Stephen King (through the courtesy of Hodder & Stoughton). This week my blog reached a milestone, it was its 100th post. This got me thinking for a while, what I’ve made here and what I’ve achieved since I started the blog. So even though I’m quite happy with all I did here on Dark Wolf’s Fantasy Reviews I feel the need for something new, too. So, I have been thinking at this for a while now and with the blog’s milestone I thought even harder on the matter. As you know I really love reading in general and Fantasy literature in particular (followed closely by Horror and Sci-Fi). Also you know that I’m really in love with Fantasy art, featured on covers of novels, game books or otherwise and this passion was covered on a few posts made here in the past. I’m working now on a material for my blog about Fantasy art (I hope it will be ready next week) and because of this material and my blog’s milestone I decided that I will introduce a weekly post about Fantasy and cover art. I feel that this type of posts isn’t far from the objectives of my blog, they will compliment my reviews, interviews and news about Speculative Fiction and they will bring something new to my blog. So from next week my blog will feature a weekly post about Fantasy art and I hope you’ll really like it. If you would like to share your opinion on the matter it will be the most welcome as always. “30 Days of Night” is a graphic novel that was adapted in a movie. Now one more link was added to this chain, the movie novelization written by Tim Lebbon. Barrow is the northernmost settlement in North America and the city is preparing for the usual month of darkness. The citizens of Barrow are well aware of what this month brings every year, so some of them are leaving and some of them remain in the city. What none of them knows is that this year the dark comes along with a new menace for the town of Barrow. “30 Days of Night” by Tim Lebbon is a new kind of read for me. Because I’m used to read a novel first and after that I see the ecranization based on that particular novel. It is for the first time when I go the other way around. Also in most of the cases the ecranization seem to be no match for the novel that inspired them. But in this case the novelization made by Tim Lebbon equals and even bests the movie “30 Days of Night”. I assume that working on a pre-established setting can be hard for the author and that can constrain the author’s imagination. But Tim Lebbon manages to write a captivating novel despite this inconveniencies and he manages to bring new elements to his novel. The novel kicks off in full action and throughout all its length the pace doesn’t drop down. Because of this steady pace and the amount of action the novel keeps the reader in alert most of the time. Also some of images created by the author have an almost visual effect that contributes to the entertainment of the reader. Another good point of this novel is the characterization. Even though the author doesn’t go too much in depth of the characters he manages to make them likeable. The main characters benefit of description of their emotions and of the psychological aspect caught by Tim Lebbon. These aspects brought by the author on his novelization make a good contribution to the improvement of the characters of the movie. The negative characters have their share in the novel, too. Here the author doesn’t bring anything new in their construction, but it might not be his entire fault considering that he worked on a pre-set course. Overall, although Tim Lebbon worked on a restricted level he manages to make an entertaining novel. 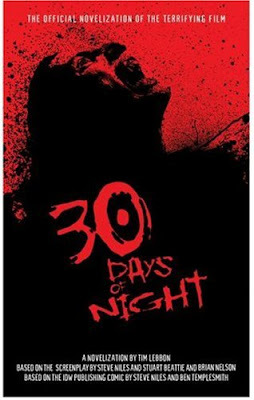 And his novelization of “30 Days of Night” is a fun horror novel, full of action, which can stand on its own, too. It seems that August is a good month for great contests, so here comes another one. Paul at his wonderful blog Blood of the Muse is offering one copy of "Heart-Shaped Box" signed by the author, Joe Hill. 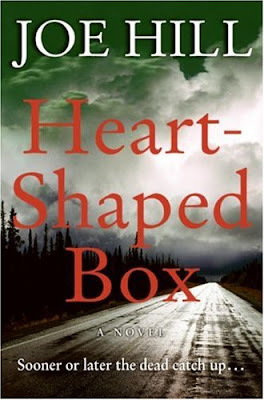 As you may know I'm a huge fan of Stephen King and I believe that his son, Joe Hill, has a future full of potential because "Heart-Shaped Box" is an interesting read. So I will grab this opportunity and if you like to do the same you can go to Paul's Blood of the Muse for full details. Good luck everybody. John at Grasping for the Wind continues his questions and answers gathered in "Ask the Bloggers" posts. Among those who answered his questions you can find me, too, and also I was delighted to contribue with a question. It is a very interesting series of posts, that you can find at John's Grasping for the Wind (question 1, question 2, question 3 and question 4). As I said John has an interesting series of questions for bloggers and as a coincidence this week question that deals with the rewards of blogging comes with my blog's first milestone. This is my 100th post since the beginning of Dark Wolf's Fantasy Reviews, so coincidental to this milestone my answer at Grasping for the Wind covers the rewarding moments offered by my blog until now. - "The Eye of the Moon" by Anonymous (through the courtesy of Michael O'Mara Books). Thank you all very much and I'm looking forward for this reads. I've spotted this meme on Chris Roberson blog, Roberson's Interminable Ramble. I found this one pretty interesting, so I'll do my birthday meme too. Look up your birthday in Wikipedia. Pick 4 events, 3 births, 2 deaths, and 1 holiday. 1945 - World War II: Soviet Union forces invade Austria and take Vienna, Polish and Soviet forces liberate Gdańsk. 1981 - President Ronald Reagan is shot in the chest outside a Washington, D.C., hotel by John Hinckley, Jr. I had fun a lot of fun doing my meme, so I warmly recommend doing yours. I stumbled upon another very interesting contest. Matt Staggs is offering on his interesting blog, Enter the Octopus, a chance to win a free copy of the July/August 2008 issue of "Weird Tales" magazine. I've always wonder if I should make a subscription for this magazine, it made me very curious about its content, so I grabbed the opportunity to sign up for this contest. If you would like to win this free magazine you can find the rules at Enter the Octopus. Good luck. 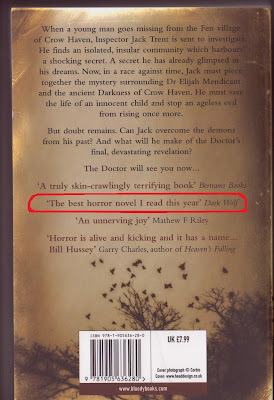 Joseph D’Lacey’s novel, “Meat”, has a comment from Stephen King on its cover and this can turn the interest of many readers. But this comment can work on both ways so it can turn against the novel. The town of Abyrne is a decaying town, positioned in the middle of a wasteland and that depends heavily on the meat supplies. These supplies are provided by Magnus Meat Processing Plant, but it seems that the quantity is insufficient for the whole town. Richard Shanti works in the slaughterhouse of MMP and is nicknamed “The Ice Pick” because of his efficiency. But he has doubts about his work and about the entire process of obtaining meat. He is investigated by the local church and also he meets a man with a different vision about the city survival. And all this will make a sudden turn in his life. I will admit from the start that I like eating meat. I will admit that I know from where the meat comes, I know the process of obtaining it and I know that slaughter houses can be a cruel place, but this novel made me think again on this entire process. Joseph D’Lacey's idea for his novel is good, he creates “the cattle” that provides the meat in the novel in the most shocking method. This image of “the cattle” is grotesque and disturbing, but the story behind this image fails to sustain it. After the initial shock and horror created by “the cattle” image I wasn’t shocked or surprised by anything else. And this is a great minus for a horror novel in general and for “Meat” in particular. Also a lack for this horror novel is the lack of many action scenes. And the general action although moves steadily, it moves to a predictable end. The characters failed to wake up my interest. They seem a little shallow and they act in concordance with what they believe to be right or wrong, but without the reasons that stay behind their beliefs. The story is told from the perspective of a number of characters. But this contributes fully at their lack of development and at my indifference for any of the characters. Actually one of them did stir my interest for a bit, Parson Mary Simonson, but what would have been a very interesting inner conflict is vaguely treated. So I lost interest in this one, too. The setting would be interesting also, but again its development fails short. The novel is a dystopian, set in a post-apocalyptic world. But the novel has many questions unanswered like what made the world a huge wasteland, why Abyrne is the only surviving town, why “the cattle” developed in its present state and who is behind the new religion and the new lines of conduct preached by the new Bibles, “Gut Psalter” and “The Book of Giving”. I liked the idea of the new religion and I would have liked to see it developed. But even though I found it the most interesting one I found it the least developed one, too. And a potential interesting conflict between the cleric and the laic is touched only on the surface. And considering that this is a dystopian novel I find hard to believe that humans can feed themselves only on spiritual level and only with sun light. 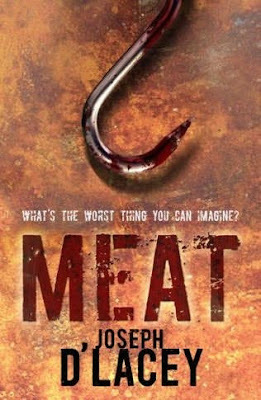 Like I said in my introduction a comment from Stephen King on the cover of a novel can work in both ways, but with all the respect for the work made by Joseph D’Lacey in writing his novel, “Meat” fails to meet any of my expectations. Yesterday I discovered one very attractive giveaway at Fashion Piranha. 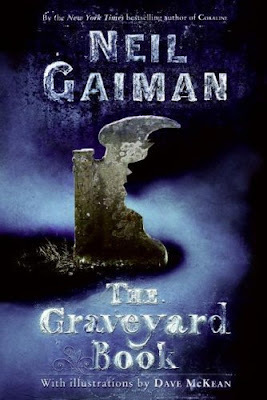 It is a Neil Gaiman giveaway, named properly Neil Gaiman Extravaganza!, with a great number of prizes. And for every 50 entries another prize is added to this great contest. Be sure to check it out because among the prizes we have: an ARC of "The Graveyard Book", one copy of the graphic novel "Coraline", a paperback copy of "American Gods", two hardcover copies of "Anansi Boys" and many other goodies. The entries are collected until August 31th, 2008, and are open to anyone. You can find out the entry conditions and the full list of prizes on Fashion Piranha. I have to admit that I have a weak spot for the post-apocalyptic scenarios no matter if they are treated by movies, games or novels. 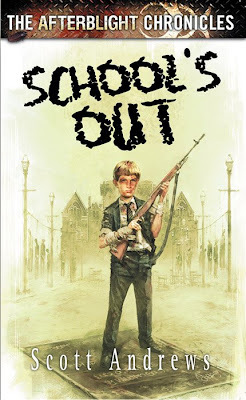 Scott Andrews’ “School’s Out” picked up my curiosity because it is a post-apocalyptic novel. After an apocalyptic event, The Cull, which killed all the humans that didn’t had O negative blood many students come back to their school, St. Marks School For Boys, in search for a shelter. Among them is Lee Keegan, a fifteen years old boy, which awaits his father to return here. But the school resemblance a military facility now and the surrounding ground a battlefield. “School’s Out” is pretty much what it states it is, an action novel set in a post-apocalyptic world. The novel is written from the perspective of the main character, Lee Keegan. I was introduced since the beginning of the novel in the general scenario and the author manages to create since start interesting characters. Even though the majority of them doesn’t benefit from an in depth characterization, the two main ones are pretty well build. Besides Lee Keegan, a character that made me sympathetic to his sufferings and its own moral questions, I discovered Mac to be a strong character. Mac is a former prefect of the school that used to bully the small children and he’s in antithesis with Lee. Scott Andrews starts his novel in a pretty fast pace, but after the initial part the action slows down for the first third of the novel. This first part focuses mainly on Lee’s difficulties to adapt to the new situation. Also here it’s built the conflict between Lee and Mac and the divergences between their ways of thinking. In their conflict I could see glimpses of the philosophical theme behind leadership, but this theme is touched only on its surface. The rest of the novel benefits from a lot of action, high paced and with rapidly succeeding events. All of these events are violent in a more or less grade and with a lot of bloodshed. The novel had some elements that didn’t sit well with me. First of all, in a true Hollywoodian style, some characters refuse to die easily. It takes a great range of methods and an entire arsenal in order to deal with them. Another thing is even though the characters are children they fight on equal terms with grown-up men, in spite of size or strength. Also they seem to have no problem killing with ease other human beings, without having remorse or being mental affected. It is quite hard to believe that all of them will be hit by killing frenzy. Scott Andrews’ “School’s Out” is not a philosophical or serious read and it will not force your mind. But it is a fun and relaxing read, very appropriate for lazy vacation days, which picked my curiosity for “The Afterblight Chronicles”, the novel being a part of this series. When I’ve started this blog I sat and thought on what I want to do and achieve here. Mainly it was my passion for reading and my try to push this passion a little farther. I never pictured myself as a writer but I always had an opinion about my readings and this blog gave me the opportunity to put them in order and make them reviews (I took the example of the blogs I read). It is also the unique feeling of being read and although I’m not a writer it is good to know that my work is read. Another decisive factor was the opportunity of receiving free books. Don’t get me wrong, I buy a load of books (more than I can read), but this is another unique feeling and also the sense that my work is rewarded. What never crossed my mind was that someday a part of one of my reviews will end up as blurb on the back of a novel. With all my sincerity I didn’t know this thing it was possible. But when Bill Hussey told me that a part of my review for his novel, “Through A Glass, Darkly”, had made his back cover I was not only surprised, but also thrilled. I know that it isn’t much, I know that it is not a very elaborate phrase, but still, I’m overjoyed. I don’t know how long this blog will run, I don’t know if it will happen again, but besides the great things that I achieved here (friends, readers, books) this one is another achievement made by my blog that I will hold dear. I want to thank Bill Hussey for letting me know about this blurb and for the photo of the back cover. Meme: Top 48 Scifi Films Based on Books - Read or Not? John from Grasping for the Wind tagged me on this one, so here is my list. * Copy the list below. * Mark in bold the movie titles for which you read the book. * Italicize the movie titles for which you started the book but didn't finish it. * Tag 5 people to perpetuate the meme. Well, as always, the good things come to an end so the vacation is over. But if all the great things last forever than they will be a common thing and wouldn’t be enjoyed very much. We had a marvelous time, Portugal is a beautiful country and the people are warm and hospitable. We really liked Lisbon and Porto, we saw a great library at University of Coimbra (we weren’t allowed to take photos there, but will keep a wonderful memory) and enjoyed a few days of rest and sun at Praia da Rocha in the Algarve region (most of the time I stayed where the shadows were because I really hate sun burns). I made a little change on my reading schedule because I couldn’t take “The Name of the Wind” on vacation due to her dimensions, but I read Scott Andrews’ “School’s Out” in “The Afterblight Chronicles”, Joseph D’Lacey’s “Meat” and Tim Lebbon’s “30 Days of Night”. I will start reading Patrick Rothfuss’ novel these days and from the next week I will post my reviews of the books read in vacation. I also enjoyed seeing my wife caught up by “The Shadow of the Wind”, this great novel and one of my favorite books ever. Unfortunately at my return home I came upon one very bad news. I read the announcement made by my friend Robert at Fantasy Book Critic stating the end of his interviews and reviews. It is sad because the blogosphere loses her best reviewer. I perfectly understand his motives, but it still saddens me. Torre de Belém is one of the symbols of Lisbon and we had muscular fever after going on top on some very steep stairs. Cabo da Roca the most western continental point of Europe and as you can see a very windy one. We had some monkey business in Gibraltar. Praia da Rocha is where we stayed for a while and enjoyed some sun and rest.